Edmund Schroder was a native of Alameda, Calif. He attended St. Mary's College. His career in aviation started in 1929 at United Airlines and its predecessor. He worked there until World War II. In 1942, He joined the Air Transport Command as a major and served as chief of maintenance of the Africa‑Middle‑East Division, the India‑Burma‑China Division, the Ferry Division, and A.T.C. Headquarters. He left the service as a full colonel. In 1945, Edmund joined American Airlines. He has served in executive capacity in line maintenance, overhaul, industrial engineering, and quality control. In the spring of 1955, he completed the Advanced Management Program at the Harvard Graduate School of Business. When Edmund joined Seaboard on November 15, 1955, he 27 years of civilian and military aviation experience. He was appointed Seaboard's Vice President ‑ Maintenance, a new position resulting from the split of maintenance and engineering. 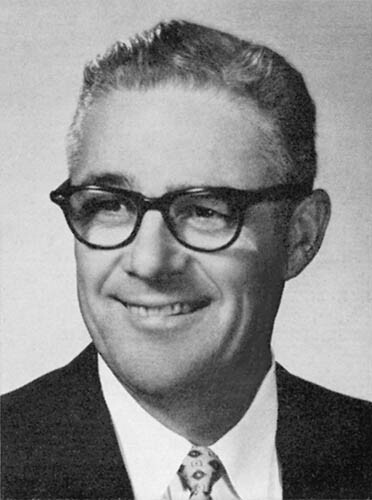 The photo appeared in the Winter 1956 issue of The Airtrader, the company newsletter, when he was hired.